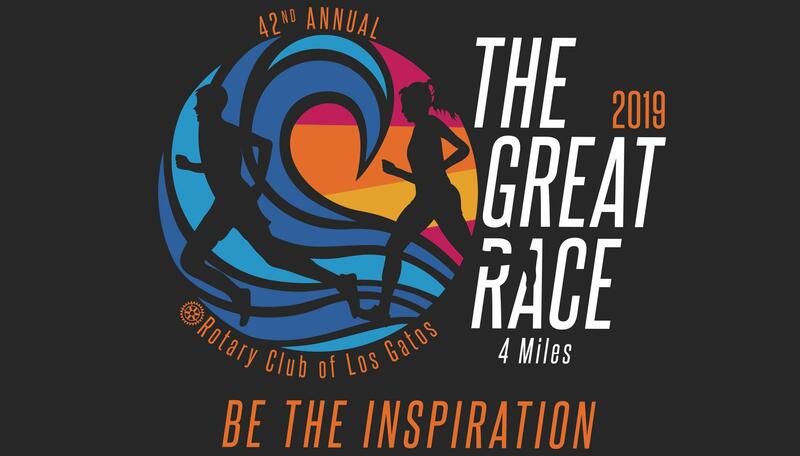 On April 28, 2019, the Rotary Club of Los Gatos presents the 42nd Annual Great Race, a scenic footrace/walk from Saratoga to Los Gatos. Since 1978 this community event has taken participants from the South Bay and beyond 4-miles down Highway 9 from Big Basin Way in Saratoga to N. Santa Cruz Ave. in Los Gatos. Everyone is encouraged to participate and running clubs are excited that this race is now on the USAFT Pacific Road Racing Grand Prix Schedule. Over 1,200 people are expected to participate. Also we are continuing complimentary access to photos taken at the event by professional photographers. You will be able to download- at no cost- all individual and group photos and shots of you breaking away from the pack! Keep those cell phones in your pocket and let a professional take photos this year. This is a $20-$50 option at most races that is included to enhance your race experience. This fundraiser has become a tradition for locals and is great for racers, joggers, walkers and families. Special rate for kids 12 and under. Proceeds benefit local youth and charities Rotary supports. It all started back in 1978 when Bill Glennon, then the mayor of Saratoga, suggested a race--a "Great Race"--between the neighboring communities - Los Gatos, Monte Sereno and Saratoga. More than 1,200 people are expected to participate in the the 42nd annual race Sunday April 28, 2019--everyone from competitive runners to moms pushing strollers, from children to senior citizens, from those out for a challenging workout to others just hoping to enjoy the scenic jog down Highway 9. Participants will be able to download for FREE photos of themselves running and finishing the Great Race as well as any other photos taken on race day. Keep those cell phones in your pocket and let a professional take photos this year. This is a $20-$50 option at most races that is included to enhance your race experience. A scenic footrace/walk down Highway 9 from Saratoga to Los Gatos. Whether you are looking for a great course for your best time, or a fun individual or family run, this is the event for you. The four-mile scenic route begins at Big Basin Way—between Third and Fourth streets—in Saratoga and follows ascending Highway 9 toward downtown Los Gatos for the finish on North Santa Cruz Avenue and Elm Street. Please note start time of 8:30AM. 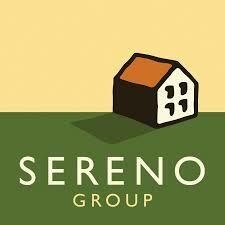 The event is great for runners, joggers, walkers and families. Please keep your pets at home. This is a $20-50 option at most races that is included to enhance your race experience. Proceeds of this race provide financial support to Rotary charities & scholarship fund for local and international organizations. Rotary has been able to give $124,000 in years past because of your support and participation in events like this. Approximately $40,000 went directly to local high school seniors to help with higher education. The Los Gatos Rotary Club took over the race over 30 years ago. 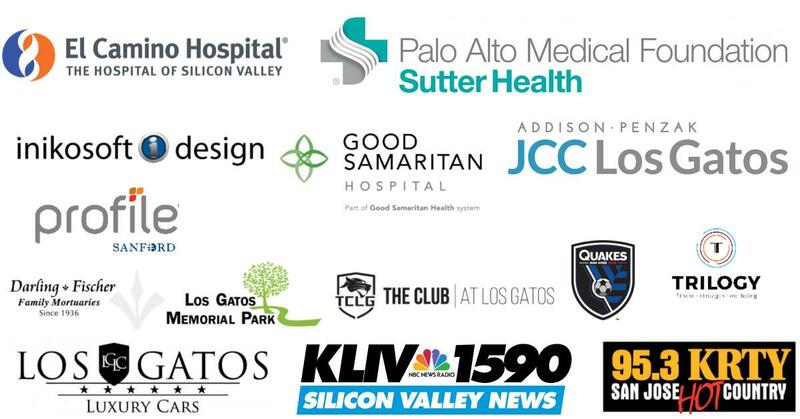 Rotary Club of Los Gatos was chartered in 1924 and has been dedicated to serving the local and world communities. The mission of Rotary International is to provide service to others, promote integrity, and advance world understanding, goodwill, and peace through its fellowship of business, professional, and community leaders. This race is a fundraiser and all proceeds benefit Rotary's n0n-profit charities and student scholarship fund. Last year Rotary was able to award over $40,000 to high school seniors in our community. Please stay after the race at the Fun & Fitness Fair with food, massage therapists and other local businesses. If you would like to be a vendor at the Fun & Fitness Fair, please contact race director. Top 3 racers from each age group will receive an medal to wear proudly around their neck. 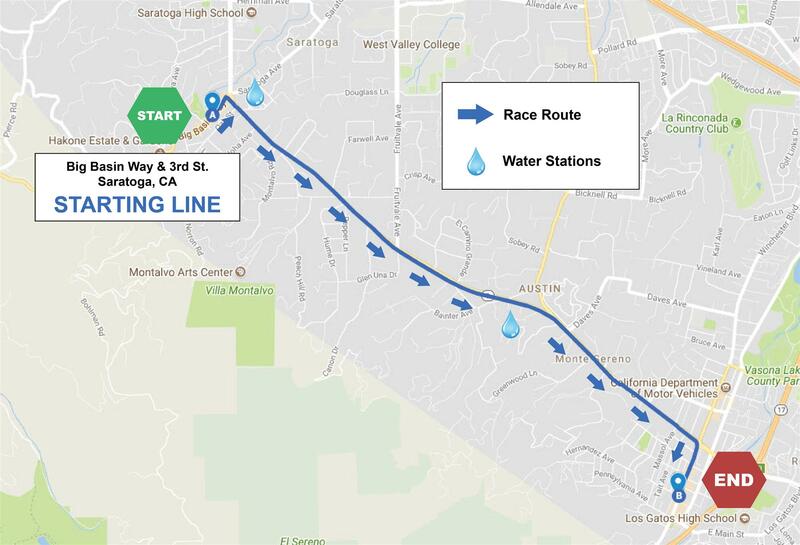 Shuttles will be provided in Los Gatos from 6:45-8:00 AM to bring 4-mile runners to the starting line in Saratoga. The buses will be leaving from the parking lot on Grays Lane just north of University Avenue. Sweat truck: Leave your sweats on the bus or at the starting line in Saratoga and pick them up at the Fun & Fitness Fair in Los Gatos. We recommend catching the shuttle bus earlier rather than later to prevent bottlenecks and missing the starting time. Last bus will leave 8am. Sponsors - thank you we can not hold this race without your support!